Update on the release of the Mostro kits. As posted elsewhere we have been waiting for a few parts we shipped out to third party vendors that needed processing to be completed. We received most of them back and there’s only a few left that we’re waiting for because of delays who our suppliers blamed mostly due on the holidays. In the meantime we kept testing the units and we found that after the last change of adding the double one-way bearing we created a situation in a part that had previously had perfect performance but due to the new design wear showed up and had to be recently corrected. As you can seen in the pictures below the new parts we announced for the double one-way included what we call a conical pulley because it’s shaped as a cone. 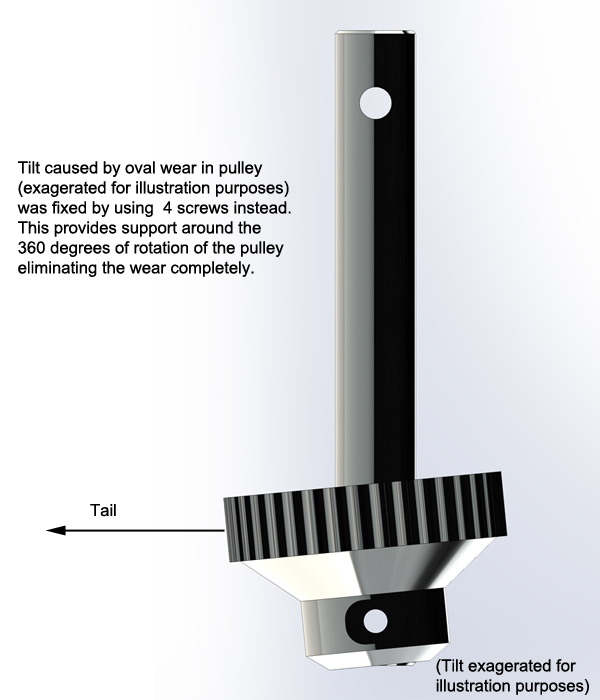 This conical pulley is the one that drives the tail pulley. In the part we announced we kept the original bolt pattern using one through bolt and nut. 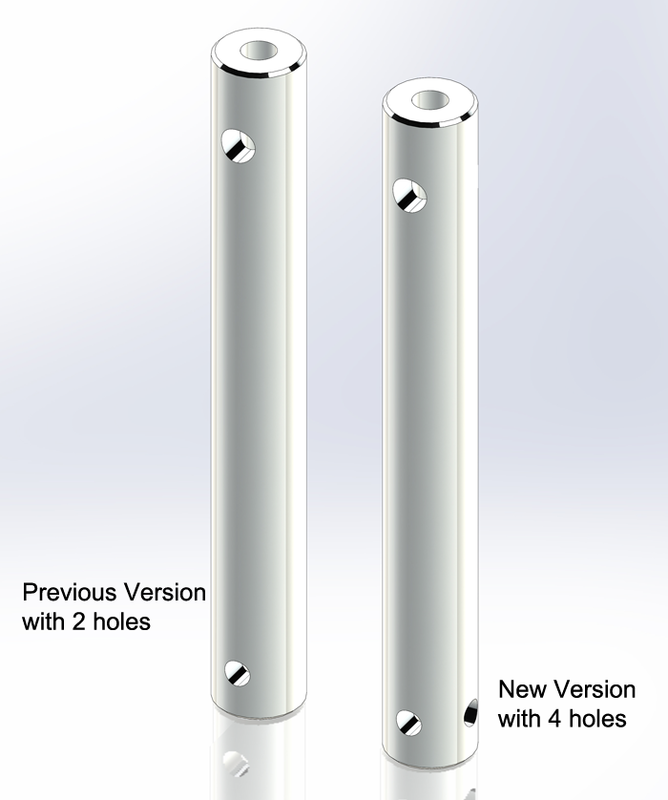 The initial testing showed excellent performance but recently we noticed that play had developed in the shaft contact area because the original single bolt and nut design doesn’t offer support for a new torsional strain created by the new conical shape. We discovered that when the bolt was parallel to the boom and when the tail blade rotor is under load the force from the tail blades under load would not move the conical pulley but when the bolt was perpendicular to the boom line then the conical pulley would not have a locking fastener preventing the rotation of the top of the conical pulley towards the tail. This very minute rotation with enough flights generated a very small play by slightly deforming the shape of the pulley shaft contact area into a slightly oval shape. Even though it’s not something that can be seen in plain sight when you measure the diameter across and perpendicular to the bolt with precise instruments there are very slight differences of diameter of a couple of thousands of an inch that indicate the in time it could become a problem. Even though for a customer the problem would take hundreds of flights to appear we decided we can’t sell a product with a known wear issue so we corrected the problem by using four screws that offer support and prevent play at any point of the rotation of the conical pulley. 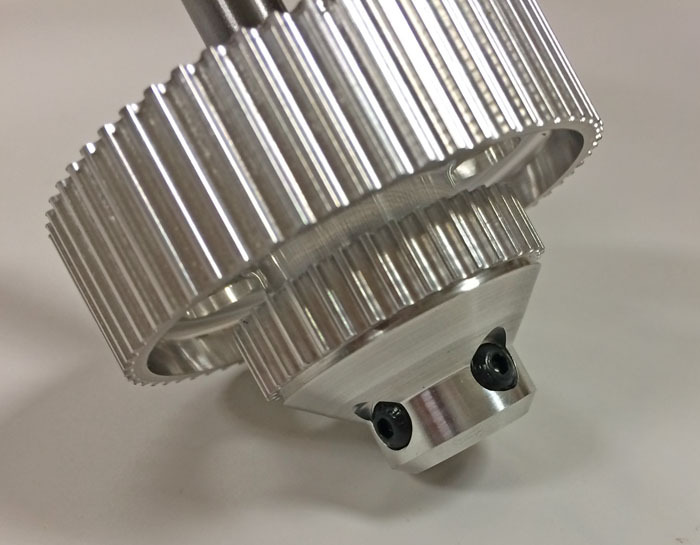 The new conical pulley and new shaft have been in production for a few days. We decided that in order to make the kits available faster we will not wait to have them all ready but instead we will start shipping kits as soon as those two new parts are being finished once we receive back the remaining parts being processed by third parties. The kits will be shipped in the strict order in which they were ordered. If you were smart enough to pre-order your kits you will be receiving kits soon. Same with Dealers that placed orders ahead their customers will receive kits sooner than dealers or customers who placed orders later but then again a strict first-come first-served policy will be used. Keep in mind that we don’t know the exact date that we will start shipping kits but based on the current information we’re expecting that around the beginning of February there should be a good number of kits shipped as we normalize production and will continue to ship as a regular product. 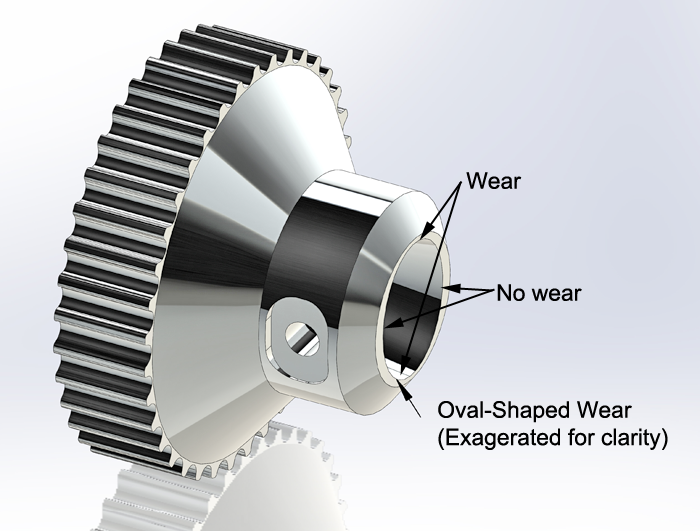 New conical pulley with four screws prevent the play in all positions and eliminates the wear. New four-screw intermediate shaft for the new conical pulley. Hope you had some happy holidays and we wish you a happy and prosperous New Year.